“I’ve never broken a bone, perhaps because I haven’t taken many risks in a bodily regard. I have a sensible respect for heights and for sports regarding balance, choosing to stay far away from skateboarding, ice-skating and skiing. 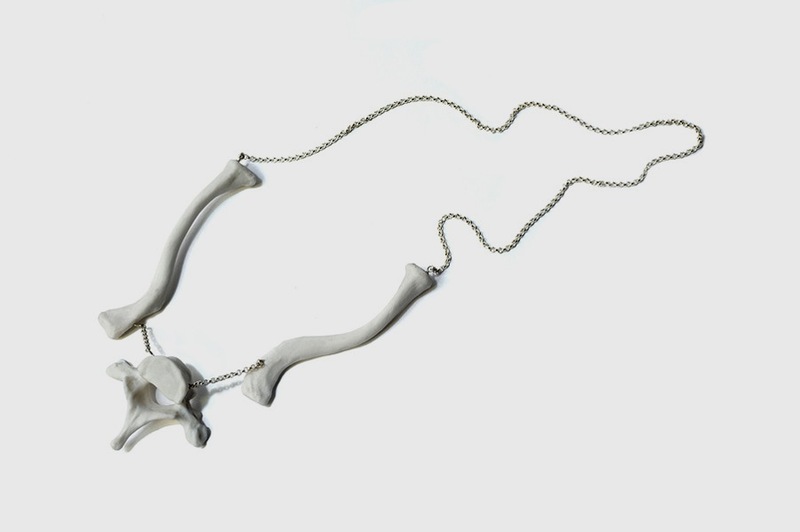 This neckpiece is made from human bones, cast from those of a skeleton my father required for his studies in the 1970’s. He bought it from an older student and all I know about this skeleton is that it was a woman and that the newspaper I found lining its bag is from the Bendigo Advertiser 1936.